Marc Alós and the whole family in the workshop (insert) MANEL LLADÓ. In a globalised world like ours, finding an original Christmas present has become increasingly difficult, but the caganer is something everyone likes; it’s different, funny, and not expensive,” says Marc Alós, from the company that makes the famous crappers. 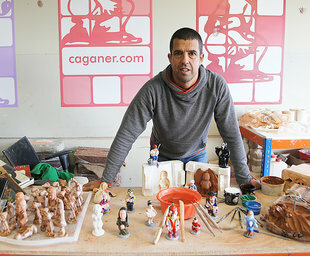 Caganer.com is a family business that was set up in 1992 by ceramicist Ana Maria Pla and her husband Josep Maria, with the help of their two sons, Marc and Sergi, who are now in charge of the business. Marc is a sculptor and Sergi runs the sales department. The small irreverent figure of a man doing his business, required in any nativity scene, are very popular, and now there are caganers representing public figures from the local and international scene. They produce about 50 new characters every year. “It’s an original gift, something from here that doesn’t exist anywhere else in the world, and which represents the Catalan sense of scatological humour. We try to keep up-to-date with the news and introduce more female characters, like this year with Teressa May. Gender equality is important in the world of caganers, too,” says Marc. 1. Father Christmas. The first caganer I made, back in 1992. 2. The clay. Our basic material. For us, it is very important that all the materials we use are locally sourced. We buy our clay from La Bisbal, to make sure it’s local and good quality. 3. Tools. These help us clean and give shape to the caganer once we take it out of the mould, when it’s rough and needs polishing. Each piece is handmade, so it’s unique. 4. A bag full of talc. This helps prevent the clay from sticking, and so the pieces don’t break when handling them. 5. Water. The clay and water complement each other. Water is needed to get the required degree of moisture, and it helps finish off the pieces. 6. Sponge. Together with water, this helps with tidying up and fixing whatever doesn’t look right. 7. Mould. A key tool, this one is Einstein and of course each character has their own. We make them in our workshop, first with a model, then with a special silicone, and it has two halves, each one for a part of the character. The process is long and requires lots of patience and experience. 8. Paintbrushes. These are needed to paint the untreated caganer. We’ve got many and different kinds, some used to fill in the figures, and others for small details, such as eyes, eyelashes... We use a fine Russian brand, made of European pine marten (Martes Martes) hair. 9. Paint. We try to use paint and colours to make them look real, but also making them as vivid and attractive as possible. For David Bowie’s, for example, we studied many photos of him and then made a design easily recognisable to everyone, but eye-catching in terms of colours and outfits. 10. Books. This is a symbol of our love for reading and the fact that we’re mainly self-taught. We studied how to make moulds at the Escola de Ceràmica in La Bisbal, but in our job we need constant training and we do monographic courses very often. We had to learn a lot by ourselves, too, so I chose books to represent that part of our job.